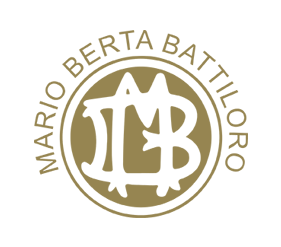 Mario Berta Battiloro opened in 1969, wishing to carry on the ancient family craft begun in distant 1926. In this historic artisan laboratory, gold, silver and other precious metals are transformed into ultra- slim leaves, suitable for applications in multiple fields. The pivotal pillars of the company are its artisan production, which allows it to satisfy the most exacting requests, and its handcrafting, which allows it to obtain a superior quality finished product thanks to the negligible alterations the raw matter is subjected to. The new millennium’s competitive challenges are met by the special attention given to innovation, both in the product itself as well as in its processing, aimed both at top customer satisfaction and discovering new horizons for its applications. The company caters for professionals in the field of the arts, food, cosmetics, furnishings. This is the spirit with which the company motivates its entire resources on a daily basis. With the awareness and conviction that every target reached does not represent the finishing-line, but a new departure point for continually expanding its boundaries. It is an expanded vision of the original company mission, following a need for diversifying its product and services portfolio compared to what represented the company’s core business for decades, that is, producing ultra-slim gold leaves used exclusively for artistic decoration. In fact the very fast dynamics of modern markets make it necessary to jump at once on the bandwagon of the opportunities emerging incessantly and, along this direction, to compel companies to structure their R&D functionality in order to take advantage of commercial openings that offer ever renewed market niches. This then, as described in the introduction, is our corporate mission, translating into words the breadth of the strategic vision with which our firm faces up to the competitive challenges of modern markets. n order to attain its corporate “Mission” targets, business at Mario Berta Battiloro is inspired by specific values. Among them, “maximizing customer satisfaction” urging the firm to try and surpass the expectations of its public; “the embracing of an enthusiastic spirit” by its staff, who must be strongly motivated and passionate about their work; “inefficiency reduction” to reach the best quality/price comparison in our offers profile; “orientation towards innovation” as a strategic key for competitive success, all translated into investment in new technologies and staff training. In addition, “environmental care” as a guiding principle for the entire corporate operations; “exploitation of internationality” as a permanent source of competitive advantages; and last, but not the least important, “promotion of territory development” and “adopting a solidarity attitude”, all represent the attention Mario Berta Battiloro reserves for the urban and social environment it operates in.